My first experience with El Salvadorean cuisine was not a good one. I remember going to a restaurant in the Bay Area and thinking how awful these pupusas were. I was bent on never eating them again. Fast forward several years later and we’ve moved here and I’m looking for places to eat on Yelp and come across this little place, a solid 4-stars and there were other items people raved about other than the pupusas. I thought “okay, let’s give this another try” and I guess, the rest is history. Drink orders are taken almost the minute you sit down and when they bring those, a bowl of curtido –lightly fermented cabbage slaw with red chilies and vinegar — is also brought to the table. On my first visit to Pupuseria San Sivar years ago, I remember didn’t order a pupusa. I ordered the caldo de gallina criolla, a very flavorful chicken soup, another Yelper favorite. On that first visit though, I did end up trying the pupusas that were ordered and found that they tasted nothing like the horrid things I tried years ago. These pillowy, soft, doughy pockets were filled with the most flavorful concoctions ever. Pupusas are traditional tortillas El Salvador. These thick, hand-made corn tortillas are filled with different things, but namely, cheese, beans or pork, or all of those. The pork used in the pupusas is called chicharron, but is different to the chidharron used in Mexican cuisine which refers to pork skin. 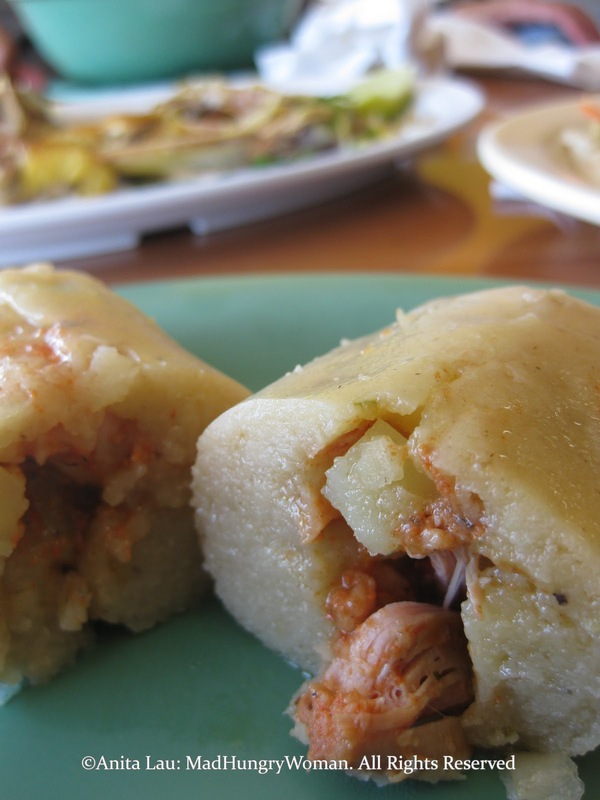 In El Salvador, chicharron is cooked pork made into the consistency of a paste. The two most common pupusas are the pupusa de queso (cheese) and more popular pupusa revuelta which includes a mix of cheese (queso), beans (frijoles), and and pork (chicharron) and you will find both of these on the menu. I’ve tried all the pupusas except the camarones y queso (shrimp and cheese) and so decided to order that on my most recent visit. Of course I couldn’t go without the queso y frijole (cheese and beans) pupusa either. However, pupusas aside, my main reason for coming on this latest visit is the chicken soup. I’ve been sick for over a week now and after eating pho ga and Chinese porridge for most of the week, I was now tired and needed something new, but at the same time, comforting and soothing. My thoughts immediately turned to the chicken soup here. Hens are used here for the chicken soup and it is clearly evident by the droplets of yellow fat on top of the soup. The quarter chicken that is served alongside also displays yellow fat, as opposed to white fat from regular chickens you get from the market. I ask about these chickens and was told that they used to get it from a poultry vendor in Westminster (probably Dakao Poultry where I get my chickens from) but now get it from a poultry vendor in LA because the owner likes to personally select each and every chicken he buys for the restaurant. Apparently the vendor in Westminster didn’t allow him to do that. Carrot, potato, chayote are all found swimming in the hearty broth. Sometimes you may even find a piece of neck bone or parts of the carcass you didn’t want to find, but fish it out if you don’t want to look at it because that is what makes the broth so utterly flavorful and different from the rest. For $8.50, a big bowl of broth with vegetables arrive with two plain pupusas, a small scoop of rice, a quarter chicken and condiments. You won’t find a better deal than this one when you’re feeling under the weather and in dire need of some comfort food stat! I’ve also had the mojarra fritta (deep fried Tilapia), tacos and quesadillas here, but those can’t compare to the Salvadorean food they offer. The Salvadorean chicken tamale is highly recommended and although the texture of the masa is a little bit different to that I’ve eaten at Mexican restaurants, the one here is infused with wonderful flavors and is very smooth in consistency. I’m not sure which I like better. I think I prefer the texture of Mexican tamales but like the flavor of these better. The food here is always good but whenever I come here, I always order the caldo de gallina criolla!! It’s absolutely THE best.